April is an overwhelming month for many high school seniors and their families, as their regular decision college application results will be released around that time. At The Edge, we are very proud of our 2018-2019 students, many of them have been accepted into the world’s top schools, such as Columbia, MIT, UChicago, Oxbridge, etc. 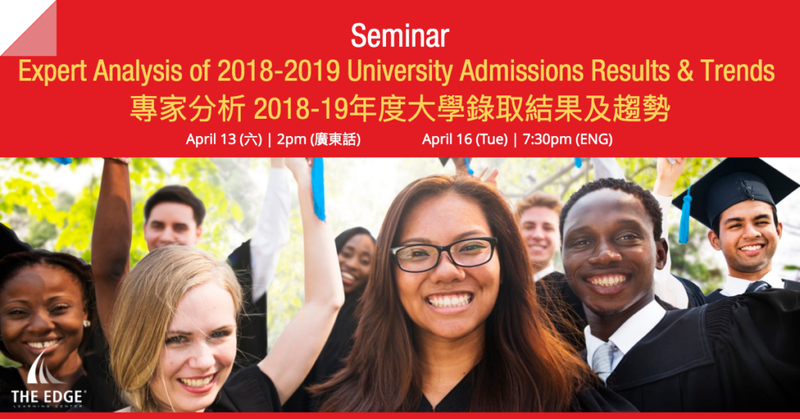 Come join our seminar to learn more about The Edge’s latest universities acceptance results and admissions trends! FREE ADMISSION. Registration is required. Please reserve online or call us at 2972 2555. The Edge Learning Center is Hong Kong’s premier Test Preparation, Academic Tutoring, and Admissions Consulting services provider. Founded in 2008, The Edge has helped thousands of students improve their ACT and SAT scores as well as their IB and AP grades. The AC team has just finished off another successful period in which student gained acceptance to schools such as MIT, University of Chicago, Columbia, and more! Check out the rest of our 2019 Admissions Results!